I, too, am allergic to solids! Finally I have met someone else with this disease! What do I do? I either finish a WIP because that really is a boost to my soul or I tackle a simple project and give it away — like a potholder. Everyone needs potholders but they rarely buy them. I need potholder brightens everyone’s day. Or a mug rug if they are a coffee/tea drinker. So whipping up an easy project for someone else usually does it for me. (I will even test a block I’ve been wanting to try and turn it into a mug rug/potholder.) Good luck! I feel your pain. Mind you mine is directly related to being behind in all kinds of things, and yet, here I am home on a rare afternoon and I am not sewing, knowing that it will make me feel better. My plan of attach, I am going to pull out a WIP and finish it! This I know will make me feel better, because I always feel better when I can cross something off the “List”. Hope your creative juices start flowing again soon. And as I look at the Darth Vader clock I just bought for my nephews birthday – May the Force Be With You. Maybe it’s the time of year because I have felt this way too. I feel a lot of completely self-imposed pressure to sew, blog, read blogs, respond to comments, etc. Is it too dramatic or not dramatic enough if I chalk it up to the human condition? I think we’re innately unsatisfied and restless at time. I know I am. For me, the only thing that fixes it is the passage of time. Sometimes a day or 2, sometimes longer. Sometimes I realize later that there were hormones involved! I was mostly feeling like I had too much going on at once so I looked at my sewing and blogging to do lists and designated some of them as “2014.” Right now I’m focusing on the Penny Sampler and my beginner’s series and a Christmas present. Everything else can wait. Ugh! I feel the same sort of “ehh, I couldddd see right now, but…” For the past couple of weeks. I have started drawing up plans again for when I get my self in gear and finish up a few things, but I think a mini quilt might give me the start, and finish, to motivate me to keep finishing the things I have started already. For me it would be, start a new quilt or find a completely different new vice. I am thinking about cross stitching 🙂 If none of that works…clean. Clean like you’ve never cleaned before. Cleaning can really be a great time to think and clear your head. I feel much better about everything when things are cleaned and organized. Hi Laura, I felt like that all August. I can’t really say what it was…but I know things were getting on top of me in my day job. Also I was trying to fit way too much into a day, creating much stress! Although I was kind of sewing the enthusiasm wasn’t really there. I was sewing to get projects out of the way rather than for the love of it. But as things in other areas of life sorted themselves out so did the quilting lapse. I think you know better than anyone what the solution is, maybe just take a bit of time off to work out where to go next or to focus on other things. Laura, as you are finding out, you are not the only one!! It seems like summer disappeared and for me it was incredibly busy. Not many things were getting done in the creative side of life. I am hoping that September will bring more comfortable weather which is always good for sewing and knitting. I am going to start and hopefully finish a new project between Wednesday and Thursday…..that should help. Finishing a work WIP is also a great motivator. 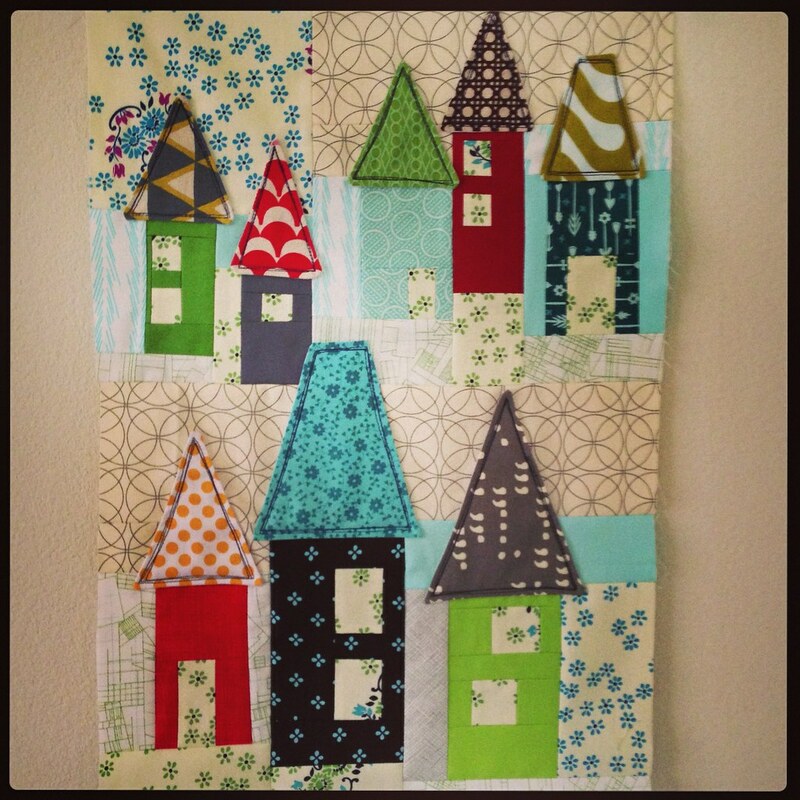 Your house block is something you should feel proud of and happy to be done…..the quilt will be stunning when you are done with it!! Appliqué will be easier than you think!! Ya know, it’s supposed to be fun. If you don’t feel like doing it, then don’t. When you do feel like sewing again, get back to it and enjoy the hell out of it. It must be that time of year – I am already hanging out for Thanksgiving….next vacation days. I have been in a little slump with wanting to finish things or having so many ideas and just can’t get them started. Especially quilts themselves. I agree it is for fun take time for yourself….did you use that gift card??? I still haven’t but I am booking it this weekend 🙂 Take a deep breath and try a couple of things to get out of a funk. I am finding choosing a small project I have always wanted to do is helping pick my interest back up – I have a pillow I want to do from pillow pop book….so that is what I am focusing on first. I hope you feel better in the next week or two. so, i was going to say – buy fabric. but, then you ended there. sooooo, i got nothing? no, hmmmm, it sounds like you have so many wonderful projects that it’s almost like check out zone. BUT, but, but don’t stop any of them – especially this penny sampler because i am smitten. you make me want to embrace no solids. also – did you say chicopee. did.you.say.chicopee. you using chicopee is going to be amazing. i can’t wait!!!!! actually, i have no advice, so ignore above except for the compliments. i think it’s this time of year when we all must repeat… “summer.will.come.again.” or is that just me?! I totally understand the funk! It’s awful. I abandoned my machine for a bit last winter and went whole hog on Subversive Cross Stitch. I managed to gift naughty sayings to all my friends for Christmas that way. Or take up a new knitting project, because a Washi dress could use a cozy cowl for the fall. Have a break, read that pile of books, take walks in the new autumn air, spoil yourself with a bunch of flowers, and just focus on the little things. Sometimes I think as bloggers we put a lot of pressure on ourselves to complete this large wonderful projects all the time to show. We should be sewing and blogging for ourselves.don’t forget though – chocolate always helps. As everyone has said, it comes and it goes. This is meant to be an enjoyable part of your life, so don’t feel pressured into doing anything your not in the mood for. I hope you get over your Quilter’s block soon. I find it hard to sew when I have other worries on my mind. Just enjoy the last days of summer with your little girl and I’m sure you will be motivated to sew soon. I hope you feel better soon. I’ve been there and sometimes we just need a break. Go to the movies or for a walk (that works for me). I’m stuck too. I think once the weather gets colder I’ll be more inclined to sew. I hope I haven’t permanently lost my sewjo. I have a lot of fabric I need to sew through before that can happen. It truly is an epidemic. I’m going to work on Barbie clothes today with my daughter. I’m hoping that she will help me to feel a little inspired to do something. I think it’s just such an in-between time. Not quite Summer anymore and not quite Fall, yet. Enjoy a beverage of your choice at your leisure and let life happen. Love that house block. It is perfect for that penny sampler quilt. I have to say that when I’m stuck I find that the best thing is to clean up all of my craft stuff. Every last pattern , scrap of paper and fabric stack and leave the one thing out that I don’t want to put away. I work on that until it’s done and then repeat until I get my mojo back. I find that chaos in life leads to chaos in craft which makes me not want to deal with my sewing because I am sick of th chaos. Hope you find some inspiration soon!